This month we sat down with Nikole Gipps. Most of Eugene knows Nikole through her Gigabots program and her awesome bot, Jimmy-Kyle, but we learned so much more about Nikole and how she wants to make an impact in our community. I am from Santa Clara, CA – in the heart of Silicon Valley. When I was growing up, my grandma worked at Apple and brought home loaner computers. I taught myself how to code Pascal using a book when I was in elementary school. Around 1995-1996 they decided to wire the schools in that area – “net day” they called it. I learned how to network from people at Intel and Cisco, and ran CAT5 cables through asbestos ceilings. In high school, I had a teacher named Mrs. Martin who was the Technology Advisor for the school and she wanted a student to assist her. I had previously worked with her on the yearbook staff – I never made a layout in my time there, as I was just there to fix their macs. I did get my degree in Animal Science, which was a pretty open-ended degree so I also had a lot of coursework in operating systems, entrepreneurship, and programming. I was never great at sitting still, so I also worked with startups and the engineering school during classes. After graduation, I pursued jobs in tech but landed solidly in the dot-com bust and ended up in a cycle of working and unemployment. On the side, I ran an animal behavior company to help people train their dogs and ran training classes at the local pet stores. 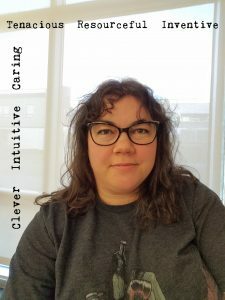 [Nikole was also a behavior expert on babycenter.com, you can see her awesome advice here] I just felt like I always wanted to do so many things, so I spent a lot of years alternating between a few different worlds that seemed very different – working with animals, working with tech, teaching people. RWIT: So what brought you to Eugene? NG: I’ve been here about 10 years. I moved here when my kids were 3 and 2 months. The Bay Area wasn’t a great place to have a family because you spend all your time in the car, sitting in traffic – so we left. I had lived all over, Santa Clara, Campbell, Oakland, Concord. My mom had moved up here about 8 years earlier and loved Eugene – she’s a structural engineer with projects all over this area, including a lot of the schools I work in now. My grandma lived in a nursing home up here and I came and visited her a lot, so I knew my way around well before we moved here for good. In the last 5 years, I’ve been doing more things in the community as my kids are older and don’t need me as much. When they were little, they were home with me all the time. 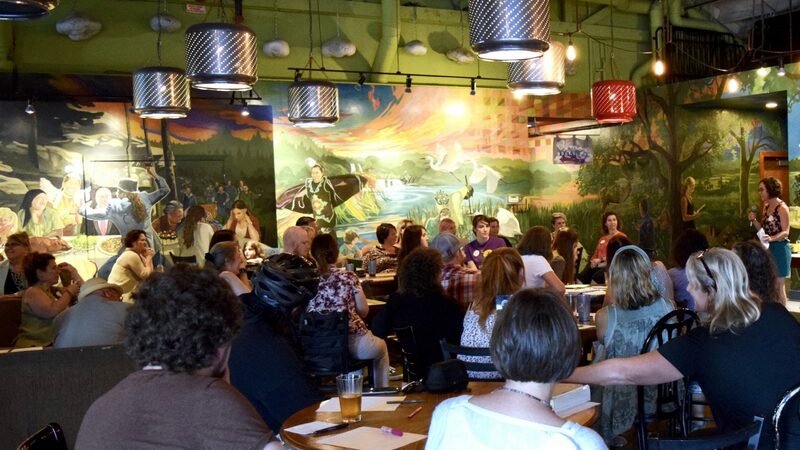 It has been great to branch out my work more into the community and get to know all the people in Eugene Tech. RWIT: Any mentors or inspirations that helped you in tech? Or was that always innate in you? NG: I feel like I’ve built my own little network of people – my Eugene tribe – and everyone contributes in some way. I feel like I’m doing some things that are uncharted territory right now and even in the tech community, I’m a bit of a mythical unicorn. I’ve been self-employed for 15 years or something like that, and no one invites the self-employed weirdo with 4 jobs on their panel. But I know if I have a problem and need to talk it through I have people in the community who are there. They are my family and we are a pretty tight group here in Eugene – everyone seems to know everyone in this community. The people here – Eugene Tech, Bitforest, and the gamers, the people are RAIN, my RWIT and EWIT ladies, Eugene Web Devs – are just so giving and generous with their lives and experiences. RWIT: Did you hit any roadblocks along the way? NG: I feel like blocks are just not a thing. I might be too naive to have it impact me but I’ve always just barrelled right through because no one told me that I couldn’t. Some people are planners but I have always been better on the fly. I think the roadblock thing is for people who plan things out more than I do, and they have to make a new plan when they hit a wall. I just go do the thing, adapt and keep running. Troubleshooting is what I do for a living, so I will find a way to make nearly anything work out. There are logistical issues that I do run into – working and kids, the mom guilt, personal struggles, balancing all the things. I did have a major burnout last year trying to have so many things in my head that my head said “no more” and I had to find some activities to just redirect my brain for a bit. I’m terrible at meditation but I found a couple of video games that make me focus long enough to tune other things out. I’m also trying to compartmentalize more because multi-tasking can be a good way to get nothing done. Doing the wrong things, running in circles- I needed to stop and breathe and focus on the things that were important. If I’m feeling overwhelmed or bogged down by issues like funding or red tape – my two greatest nemeses – then I think about what’s important. I think about how my work is impacting the kids, specific kids that have shown great improvement, or clients that I helped through a rough time. I also use a lot of humor to get through my stress. I can turn pretty much anything into a joke. RWIT: You recently spoke at Open Eugene Festival, how was that experience? NG: Yes, I was so nervous – I got up there and forgot everything. Total deer in headlights! People said it was interesting, informational and thought-provoking. I had attendees approaching me after the talk or later on that month to talk about it. I went back and tried to watch it but I’m my own worst critic. I think it’s important to keep going. I do go back to the impact I’m making and why the work is so important. I was apparently not too traumatized by the event – I’m giving a talk again at TAO Ignite in February. My friend Mark Davis (from Eugene Tech) gave me a lot of good tips for preparing for the talk, so I guess we’ll see how I do this time. RWIT: Any advice for women who are trying to get into tech? NG: I feel like a lot of people who are in the minority in the industry, they don’t talk a lot because they don’t want to be “that person”. But unless you are more vocal in what you are doing then you get lost. If you want more people to do what you are doing, you need to tell people and talk about it often, and if you are looking to move into tech talk about that too. 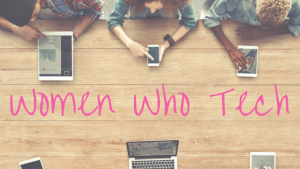 If the women currently working in tech don’t vocalize, we can’t pull others up with us. If the women looking to move into tech don’t ask about it, how does anyone know what you want? I also feel that women in tech are often afraid to make mistakes because they have to be better than everyone else. I’m learning something new right now and I’m terrified that someone will find me out! I haven’t fully learned a new language in a couple decades. It’s terrifying but you have to do it anyway. I have this mindset that I’m terrified to be wrong in front of people because I have to be that much better, which leads to me not asking questions or going to user group meetings because someone might “out” me for not knowing it. But I feel the fear and push through it anyway. It’s all about burnt pancakes – you have to mess up the first one to learn to get it right, you have to be willing to try. RWIT: What tools or resources do you recommend? NG: Go out and meet people in your industry. We have people here who are new to the area or switching careers, and they have been finding new job opportunities by being connected in the local community. If you are looking for a job go to co-working, happy hour, coffee hour, whatever it is – and don’t be afraid to tell people what you are looking for. What I’m doing right now with the kids, teaching coding with robots, that started as an idea and I just kept talking about it to everyone. Now I’m “The Bot Lady” and people are coming to me for help. If you don’t throw it out in the world and you don’t meet the people who can help you, then it won’t happen. You can find people on LinkedIn or contribute to Open Source stuff but take it to the next step. People don’t remember a name from online or a resume – you need to meet people so they can put a face to your name. RWIT: You’re doing Gigbots, grants, etc. What’s next? NG: I am a full-time developer and I love doing it. Mostly what I do is server-side – security, optimization, backend work, framework. My clients are great and I like keeping up with their changing needs. The Gigabot Coder in Residence with Connected Lane runs through the schools during the school day, 5 active schools per round – so 15 schools per year for 2 years. My role there is to continue refining the program and connect industry professionals – our coders – to classrooms. The US Ignite grant through the Eugene Science Center has 2 parts. The first part is an open education platform – the Eugene Coding Initiative – for educators to get and submit curriculum. I would love more teachers to contribute since we have a new math standard coming out next year here in Oregon. They can teach computer science as math in high school but it has to align with math standards. I want to best help them connect those dots so we can help Oregon teach computer science as a math class. The second part is connecting 2 classes of kids in different gigabit-cities to learn together and make the world a little bit smaller of a place. I’m making the curriculum for these new Cozmo bots that are at the Eugene Science Center and for a local afterschool program. They are tiny bots and the kids really connect to them, so I am excited to see what we can do with them. I think we’re also going to do some fun things with them at the Eugene Library, STEM at the Ems night, and with the local girl scouts. Eventually, I would like to trickle up to middle and high school, but it was important for me to start by reaching kids in that 3rd-5th-grade range – to normalize “nerdism” before the social factors of the upper grades kicked in. The idea is if I can do it in as many places as possible, I can give kids access to experiences they might not get a chance to have elsewhere. It’s a really big thing for me to make sure that kids who need this the most can have these opportunities, regardless of their ability to pay. I’m trying to reach kids where they are so they don’t have to find a way to get to a class or miss out because they don’t have transportation available to them. These kids have a special place in my heart because I would have been in their same position if I didn’t have the gifts that were given to me in life when I was a child. I couldn’t have afforded any of the technology I had on my own. I know they have ChickTech and Girls Who Code – it’s been mentioned to me many times, but I don’t really focus there. The poverty gap is a much bigger issue for me. I feel like we have all this marketing and the people to make the Innovation District and the Tech Sector, but it’s inaccessible for the kids who actually live here and can’t get out of the income bracket they are in. We, as the tech community, can choose to be just the problem or part of the solution as well. I want the kids to be confident with tech and help break down some of their barriers. They don’t have to be programmers, but it would be great if they could have a sense that “I can do this!” Technology is everywhere and they will be working with it at some point, regardless of their industry. Construction, farming, healthcare, education – they all use tech now. Having a sense of challenge and being able to figure it out is important for them to be successful. If they can identify with the local professional community and see themselves in those roles someday, that can create a powerful new trajectory for their lives.